A lot of web designers spend as little as possible on WordPress web hosting. They either use cheap shared hosting or manage their own VPS – or possibly a dedicated server if they host lots of sites. I believe that for most web designers, this is a mistake. By spending a little more on hosting, web designers can significantly increase their overall profitability. We’ve improved efficiency and increased profitability at Barn2 Media by tailoring our web design process around WP Engine. Here’s how you can do the same for your web design business. If you’ve been hiding under a rock for the past few years then you might not know that WP Engine is the world’s biggest WordPress hosting platform. With over over 50,000 customers in 120 countries, they host a huge proportion of the world’s WordPress websites. Unlike generic web hosting, WP Engine is designed specifically for WordPress. Their systems have been designed to provide the fastest possible environment for running WordPress. In my experience, nearly all websites load significantly faster on WP Engine than other hosts – whether it’s a shared host or dedicated environment. WP Engine also have a huge number of advanced features built-in as standard, such as security and website management tools. As a WordPress agency, we have spent a long time learning WP Engine’s systems. We have used this knowledge to streamline the web design process so that we can develop websites faster and more profitably. If you’re an experienced web designer than you probably have a repeatable process that you use for all your websites. For example, you might use the same WordPress settings for all your sites. You might install the same plugins relating to things like SEO, image optimisation and spam prevention. WP Engine lets you automate this and save time on every single project. Log into your WP Engine account and click ‘Add Install’. This will be your template site, so call it something self-explanatory like ‘mytemplatesite’. Tick the ‘Transferable Install’ option so that it doesn’t contribute to the number of active installs on your account. Log into the admin for your new template site and perform all your standard tasks. Select all your favourite settings, install your standard WordPress plugins, etc. Log into your WP Engine account and click ‘Add Install’. Select your template from the ‘Copy from’ dropdown. And hey presto, your template site will be copied to create a brand new site for you to work from, so you don’t need to spend time on the repeatable tasks you do for all sites. Most of WP Engine’s plans have a maximum number of websites that you can host on your account. The more active installs on your account, the sooner you’ll have to spend more by upgrading to one of WP Engine’s more expensive plans – which means less profit for you. Fortunately, WP Engine have a fantastic option called ‘transferable installs’. A transferable install is a restricted website that doesn’t contribute to the number of active installs on your account. The restrictions basically mean that you can only use transferable websites for sites in development – not live sites. For example, a transferable install is always password protected and you can’t point your domain to it. Your template site (which you should copy whenever you create a new website). Websites currently in development, before they go live. When a website is ready to go live, it’s easy to convert it to a standard install – either on your account or the client’s own WP Engine account. Just tick the ‘Unlock this install’ button on the WP Engine Overview page for the install. Various test sites that we use to trial new plugins, create YouTube video tutorials, film screencasts for training purposes, etc. 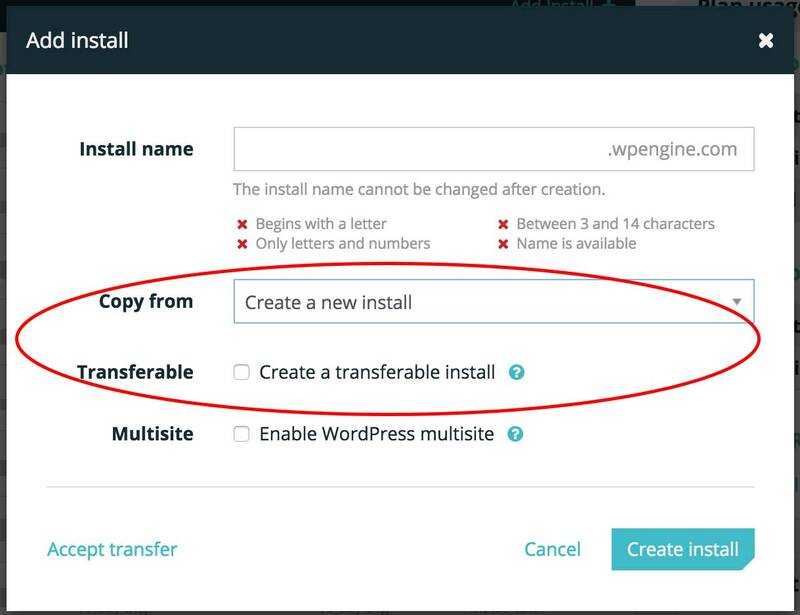 You can also use transferable installs as a way of archiving websites that are no longer needed, for whatever reason – to do this, click ‘Add Install’ in your WP Engine account and click ‘Copy Install’. Copy the install for the website that is no longer needed and click the ‘Transferable install’ box. Once it has copied, you can delete the original install. It’s always a pain when a web designer has to spend time speeding up a website they have built. This can seriously reduce the profitability of a project. WP Engine’s systems are 100% built for performance. This underlines all their systems. In particular, their built-in EverCache technology and built-in CDN (see below) make a big difference compared to adding these via other methods. For example WP Engine’s EverCache will generally make a website faster than using a separate caching plugin like W3 Total Cache and is MUCH quicker to set up. While I hope that you write good code and don’t weigh down your sites with unnecessary plugins, WP Engine is more forgiving than most hosts in terms of performance. This means that within reason, your websites will load quickly if you use WP Engine. When we first started using WP Engine, we migrated all our sites from our VPS and saw speed improvements. Migrated a complex WooCommerce website from the client’s hosting to WP Engine – page load times reduced from 6.54 to 0.82 seconds. Migrated a WooCommerce membership and events website from TSO Host to WP Engine – page load times reduced from 8.05 to 1.5 seconds. Migrated a brochure-style website from United Hosting to WP Engine – page load times reduced from 3.9 to 1.6 seconds. We also migrated a company website from WP Engine to the client’s CloudAbove hosting (against our recommendation!) – page load times increased from 0.91 to 1.97 seconds. With performance improvements like this to be had, the question for web designers is not “Why should I use WP Engine?” It’s “Why aren’t I using WP Engine?” You can sign up for WP Engine here. Built-in CDN – no more CloudFlare headaches! WP Engine has a built-in CDN (content delivery network), which you get on everything except their most basic plan (which you wouldn’t be on anyway if you’re a web designer). It speeds up websites for visitors wherever they are in the world. WP Engine provides the most efficient way to use a CDN for your clients’ websites because it’s designed to work with WP Engine’s caching and other systems. We previously used CloudFlare as a free CDN. This was ok but it caused a few problems, for example we had to route our clients’ DNS records through CloudFlare which not everyone is happy to do. It was buggy and the support wasn’t good. It’s almost impossible to troubleshoot problems when CloudFlare is involved because it adds so much extra complexity. In contrast, WP Engine’s CDN can be activated by ticking a single box and it just works, with no problems or extra complexity. This saves you a lot of time and lets you provide an extra benefit to your clients (which you can charge for if you like – we include it as standard). Instead of having to log into CloudFlare to clear the CDN, there’s a button in the WordPress admin which lets you clear WP Engine’s CDN and cache at the same time. This saves web designers a lot of time during the development process. As a web designer, you probably spend ages setting up 301 redirections for your clients using a plugin or .htccess. WP Engine makes this easy through their ‘Redirect rules’ page, so you can allocate less time to this part of the project. Backups and restores are easily one of WP Engine‘s best features. From the Backup Points page for each of your sites, you can access and download any of the daily backups that they automatically take. You can click a button to create additional backups whenever like – for example if you’re about to do a major update. You can click a button to instantly restore your site to any of the backups in the list. WP Engine’s backups are an absolute lifesaver for us. You can use them in quite advanced ways, in conjunction with their other features. For example, I once received a phone call from an angry client. He was annoyed because we had made some revisions to his site. I felt that we had improved the site but without being able to see the previous version, he was convinced that it had been ruined. While I was on the phone to this client, I used WP Engine’s systems to create a one-click staging site with our revisions. I then rolled back the main site to the previous version. I then emailed the client a link to the main site and staging site so that he could compare both versions and we could discuss them over the phone. When he could see both sites side-by-side, he realised why we had made the changes and started to like them. He was also incredibly impressed at how much I could achieve while on the phone to him. This helped to create a loyal and profitable long-term customer who we were on the verge of losing. WP Engine’s systems are fully integrated with Git. This saves web designers and developers time by properly version controlling their work to prevent mistakes. Some hosts make it a nightmare to set up SSL on a website. 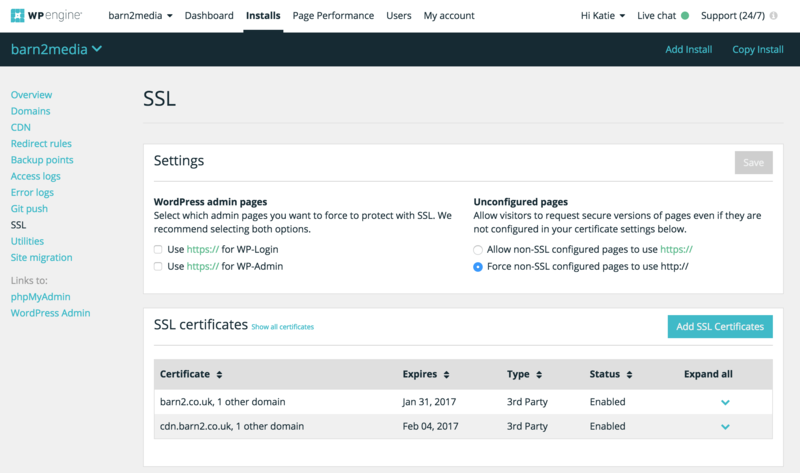 WP Engine has an SSL tab for each install, which makes it easy to purchase an SSL certificate or install a third party certificate. 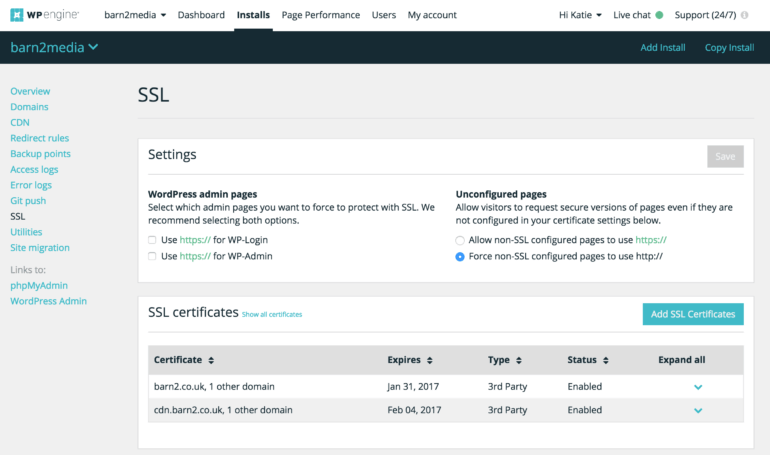 WP Engine’s SSL certificates are quite expensive so we usually buy them from Namecheap and install the certificate on WP Engine. It still only takes a few minutes. WP Engine also make it easy to set up a WordPress multisite, whether it’s on a new install or an existing site. There’s an option to set up multisite when you create a new install. There’s also a ‘Multisite’ tab in your WP Engine account for each install. You don’t have to do anything technical to configure your multisite – you just select whether you want to use a subdomain or subdirectory URL structure and WP Engine’s clever systems do the rest. This helps web developers to increase profitability by setting up multisites much more efficiently. The ‘Utilities’ page in your WP Engine account lets you instantly password protect a site. You can password protect the live site, staging site or both. We password protect websites in development so that there’s no chance they will become publicly available until they go live and the password is removed. If we have previously shown a draft website to the client and they request some changes, we change the password to prevent them from seeing the changes until they are complete. This prevents any uncomfortable situations where the client sees a work-in-progress! Once the changes are complete, we change the password back. We always password protect staging sites. This means we don’t have to password protect websites using more time-consuming methods such as adding separate WordPress plugins. WP Engine provides a free staging site for every install. From the WordPress admin, you can click a button to instantly create a staging site identical to your live site. You can then log into the admin for your staging site and make changes to your heart’s content, without affecting the live site. Lots of web hosts offer staging sites these dates. I like WP Engine‘s because they are so easy to create (e.g. WP Engine provide an instant URL for the staging site and you don’t have to make any DNS changes). Staging sites are automatically backed up every day, so you can use them for heavy duty development work without taking any unnecessary risks. You can easily roll back a staging site to a previous backup, just as you can with live sites. Once you’ve finished working on a staging site, you can click a button to copy everything from staging to overwrite your live site. You can either copy over the entire site, or you can select specific database tables to move. For example, if you have made various content changes but new users have registered since you created the staging site, you can select the tables containing your content without overwriting the user data. If a client wants to make changes to their site, we give them access to the staging site. This lets them play around without risking breaking anything to their live site. We test website software updates on a staging site before performing the update on the live site. If we’re commissioned to redesign a website we’re already hosting then we do the work on a staging site. The live site continues running happily while we redesign the version on the staging site. Once it’s complete, it’s easy to copy everything back from staging to live. We use staging sites to compare different versions of the same website. Unlike some WordPress hosts, WP Engine don’t migrate sites for free. However I don’t really see this as a problem – and in some ways it’s a benefit as it gives you more control. Hosting companies that offer free migrations often make you wait days for the migration to be completed. 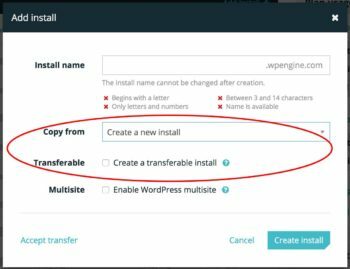 With WP Engine, you simply create a new install in WP Engine, install the WP Engine Automated Migration plugin on the site you want to migrate, and copy and paste the information from the ‘Site migration’ page in WP Engine. The plugin will then migrate the site for you. Most of the time, the migration happens seamlessly and is much quicker than waiting for someone to do it for you. If anything ever goes wrong then you can do a live chat with WP Engine support and they will complete the migration for you manually. So you do get free migrations with WP Engine, really. The migrations tool lets us migrate websites much more quickly than all the other methods we have used. This helps us to increase profitability in many ways. It saves us money at the beginning of the project if we need to migrate an old site from the client’s host to WP Engine in order to redesign it. It lets us recruit more clients onto our hosting as we can afford to offer free migrations. WP Engine are in the US and we’re in the UK. We have had problems with other hosting companies in the past due to the timezone difference. However we can always get instant support from WP Engine. All WP Engine’s support is provided via live chat these days, which is available round the clock. They got rid of their support ticketing system a few months ago. I was a bit sceptical of this at first, but it actually works really well. Most of the time, someone is available to chat straight away – or there might be a short wait. It’s always quicker than waiting for someone to reply to a support ticket. Once we get through to someone, they are nearly always a WordPress expert with in-depth knowledge of common problems and WP Engine’s systems – usually in the US. I have received some really advanced support from them and love the fact that they haven’t outsourced their support like a lot of hosting companies. WP Engine’s support has helped to increase our profitability because they do a lot of troubleshooting work which would otherwise cost us time and money. If there’s a problem with a site that MIGHT (ahem) be hosting related, we go onto their live chat and let WP Engine do some investigation. Even if the problem is not hosting-related, they provide valuable tips and error reports which help us to fix the problem more quickly. But my clients can’t afford a more expensive host! We charge £25 for hosting, which allows us to provide super-fast, reliable hosting to our clients via WP Engine. This gives us a reasonable profit margin while providing clients with excellent value given the speed, reliability and advanced features they get for their money. We can be open about which hosting company we use because the client is getting good value too. Since we’re on one of WP Engine’s more advanced plans, clients get more for their money than if they signed up direct with WP Engine. For example depending on your plan, your clients can get a built-in CD, better performance, more storage space and more visits than if they signed up direct. So there’s really nothing to hide. By using WP Engine, we can also provide various features which we couldn’t afford to include as standard with other hosts – such as backups and free restores. This lets us provide more value for money than clients can get from most hosts. A lot of clients only look at the bottom line when deciding whether or not to use your hosting or choose their own company. However much we point out the extra features such as backups with free restores and free staging sites, a lot of our clients still feel that £25/month is too expensive. This may seem crazy if they’re paying you thousands for their website, but that’s how it is! We use this simple trick to convince clients to use our hosting even if they have previously turned it down. Either design the website directly on WP Engine or upload it to WP Engine. Do this when it’s ready to show the client. Their first impressions of the site will be that it’s fast to load. Anything else will be a disappointment once they’ve seen it on WP Engine. Log into your WP Engine account. Activate all their performance features such as CDN and Object Caching (these are on the ‘Utilities’ page). Run 5 tests and work out the average – for some reason the first test is often slower than subsequent tests. Select the Pingdom server closest to you. Migrate the website to the client’s host as requested. Immediately go back to https://tools.pingdom.com/ and take another 5 speed tests, selecting the same server as before. You need to do this before making any further changes to the site in order to achieve a like-for-like comparison. It also means that if you do end up hosting the site on WP Engine, you won’t have to redo any work. Contact the client with the results of the speed tests. Explain how important page load time is for SEO, user experience and bounce rates. Ask if they’re sure they don’t want you to host the site. Point out that it’s not too late to change their mind. After all, the latest version of the site is still on your hosting. In my experience, doing this convinces a lot of clients to pay the very-reasonable £25 per month for hosting. Even the ones who have previously turned it down. It’s a great technique because as a web designer, you’re being completely open and honest. You’re simply providing actual evidence of why your hosting will benefit the client. This is much more convincing than a boring list of features. One of the main criticisms of WP Engine is that they don’t include unlimited visits in their plans. They charge an extra $1,000 for every 1,000 excess visits if you go over your limit. This used to be a problem because WP Engine included bot visits in their figures. This meant that the visit numbers were completely different from Google Analytics and it was hard to justify the extra cost to clients. Now bots are no longer included in the visit count, it feels more comfortable explaining that clients will have to pay extra for excess visits. We can offer hosting for a reasonable price for low-traffic sites. Our list of what’s included in the basic hosting cost includes the number of visits per month. If a client goes over this as a one-off then we send a one-off invoice for the extra visits. We add a bit of markup added on to cover our time etc. If a client regularly has more visits then this is an opportunity to negotiate a higher monthly cost. This is is more than reasonable given that they have a successful, high volume website. 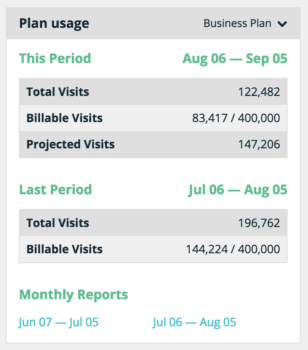 To make this easy to administer, we have set up a monthly reminder to check for excess visits. When it’s time to check, we simply log into the ‘Dashboard’ page in our WP Engine account. 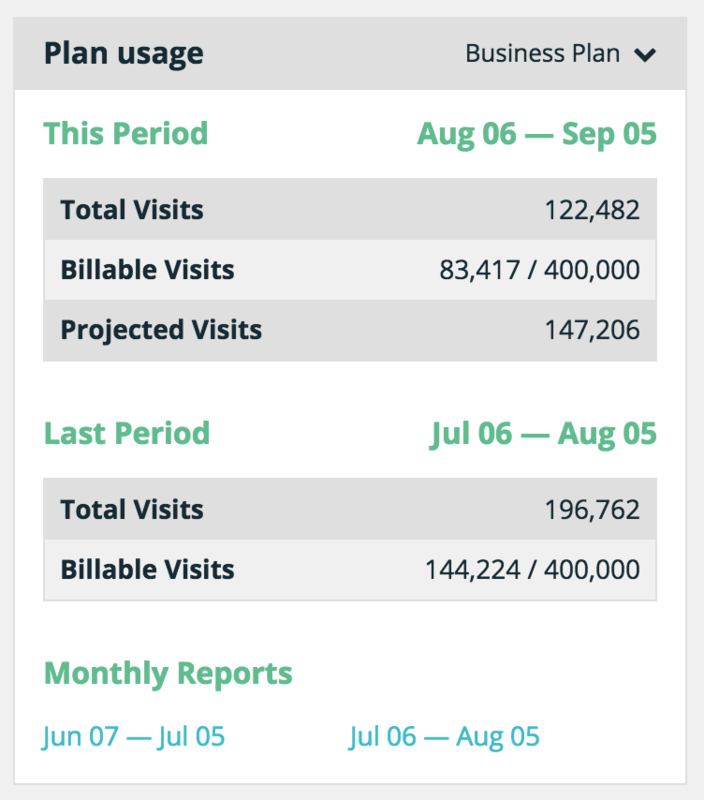 Next, we click on the ‘Monthly Reports’ links in the ‘Plan Usage’ section. These reports list the number of visits for each of our sites, with the most visited sites at the top. It only takes a few seconds to look at the first few entries on the list. You can easily see which sites went over the monthly limit. If you’re likely to recommend WP Engine to others then it’s definitely worth signing up for their affiliate scheme. It’s one of the most generous in the industry. The commission is $200 or 100% of the first month’s payment (whichever is higher) for each referral who successfully signs up to WP Engine. That’s a lot more commission than other hosting companies I’ve seen. WP Engine also offer a sub-affiliate scheme. This means that if you refer another affiliate to WP Engine then you’ll get $50 commission for each of their referrals too! If you sign up for WP Engine – either for their web hosting or affiliate scheme – it would be great if you could use one of the links in this article. When you enter this, something fun will happen and you will get the WP Engine discount code. I tried it myself and it’s pretty cool! You might also be interested in our article on choosing the right WordPress hosting for your website. Note: All the advice in this article is 100% genuine. It’s an honest portrayal of how we use WP Engine to improve our own web design processes. The affiliate links simply help to cover my time in writing this post and don’t affect my recommendations to you. Thanks! How do YOU use WP Engine to increase profitability? Now it’s your turn! If you’re a web designer, do you use WP Engine – and if not, why not? Do you have any tips on how you can use their systems to make your projects more profitable? I’d love to hear from you in the comments below.